W. Samuel Patten leaves the federal court in Washington, Friday, Aug. 31, 2018. Patten entered a guilty plea in federal court in Washington, shortly after prosecutors released a four-page charging document that accused him of performing lobbying and consulting work in the United States and Ukraine but failing to register as a foreign agent as required by the Justice Department. 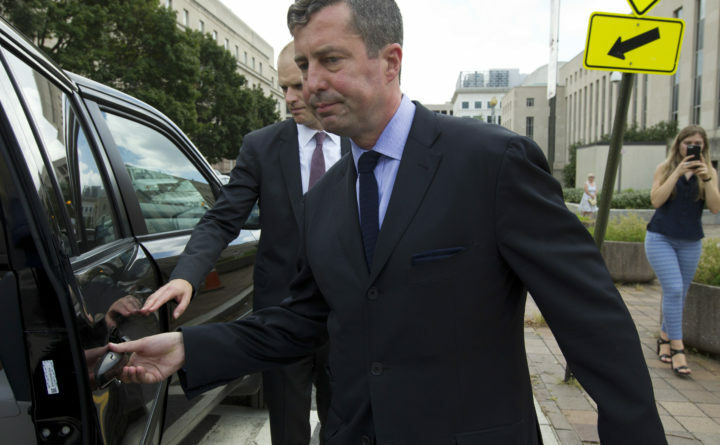 WASHINGTON — A Washington consultant who advised a Ukrainian political party and worked with a co-defendant of Paul Manafort pleaded guilty Friday to failing to register as a foreign lobbyist while working on behalf of a Ukrainian political party. Samuel Patten, 47, was charged with one count of violating the Foreign Agents Registration Act for failing to register with the Justice Department when he represented a Ukrainian political party known as the Opposition Bloc from 2014 through this year. The Maine native previously worked for Sens. Susan Collins and Olympia Snowe, both Republicans, before expanding his career in Washington, D.C.
Patten pleaded to the count before Judge Amy Berman Jackson in U.S. District Court for the District of Columbia. “I would like to plead guilty,” Patten told Jackson during a hearing. Patten also agreed he had steered an illegal foreign donation to President Trump’s inauguration, telling prosecutors that he arranged for an American citizen to act as a “straw donor” to give $50,000 to Trump’s Inauguration in place of a Ukrainian businessman who was legally barred from contributing to the event. Patten was listed as an executive and Konstantin Kilimnik, a longtime Manafort associate in Ukraine, as a principal of Begemot Ventures International, a limited liability corporation formed in 2015, as first reported by the Daily Beast. A website for Begemot linked to Patten’s email for inquiries but did not list the company’s clients, the Daily Beast reported. In court documents, prosecutors allege that Patten also worked with the two foreigners to help “Foreigner B” make an illegal contribution to Trump’s Inauguration. They said “foreign B” then attended the Inauguration with Patten. Patten also agreed that he misled the Senate Intelligence Committee when he testified before the panel in January 2018. In a plea agreement read aloud by the judge, Patten agreed to cooperate in exchange for a government recommendation of leniency at sentencing. The charge carries a maximum penalty of five years in prison, but both sides agreed there is no recommended sentence under federal guidelines. Patten stood with his attorney, Stuart A. Sears, and after surrendering his passport and was released on his own recognizance pending sentencing. Federal prosecutors previously have indicted Kilimnik and Manafort, the former Trump campaign chairman, on charges of witness tampering in Manafort’s criminal conspiracy and money-laundering case pending in the District. Manafort was also convicted this month on bank- and tax-fraud charges in Virginia. Prosecutors with special counsel Robert S. Mueller III’s office have said Kilimnik has been assessed by U.S. investigators to have links to Russian intelligence. He and Manafort are charged with repeatedly contacting two members of a public-relations firm and asking them to falsely testify about what prosecutors say was secret lobbying they did at Manafort’s behest. Laws requiring lobbyists to register if they lobby in the United States on behalf of foreign governments and political parties have been loosely enforced for years. But with Manafort’s prosecution, the Justice Department has been more closely scrutinizing such work. Violating the law can be a felony if a lobbyist fails to register knowingly and willfully. Neither Patten nor Kilimnik immediately responded to requests for comment on Friday’s federal filing. The charges against Patten were filed by the U.S. attorney’s office in Washington rather than by Mueller. Mueller’s team likewise referred an investigation into Ukraine political work by other Manafort associates, lobbyist Tony Podesta and Vin Weber, to prosecutors in New York. Jackson set an Oct. 31 deadline for both sides to report on the status of the case. Andrew Weissmann, a lawyer on Mueller’s team who has been leading the Manafort prosecution, was present in court when Patten pleaded guilty. Weissmann declined to comment after the hearing. In an 2017 interview with The Washington Post, Patten said he met Kilimnik in Moscow more than 15 years ago, when Kilimnik was an employee of the International Republican Institute, a pro-democracy group affiliated with the Republican Party. Patten ran the office from 2001 to 2004. “I relied on him,” Patten told The Post. Patten said last year that Kilimnik had been essential to Manafort’s Ukraine operation, which had been perceived by allies and opponents alike as the savviest of the American consulting operations working in the country. Susan Mary Alsop’s first husband was Bill Patten Sr., but the son she bore during their marriage — also named Bill — was not Patten’s son. The child belonged to a notable British politician, Duff Cooper, with whom she’d had an affair in the late 1940s. The younger Bill Patten — Sam’s father — did not learn about this until 1996. After Patten Sr.’s death in 1960, his widow married Joseph Alsop, his close friend. Sam Patten’s father moved to Maine, ran a small-town weekly newspaper and later became a prison minister. Sam Patten was schooled in Maine and attended Georgetown University, graduating in 1993. Manafort, 69, has pleaded not guilty to all charges in the Washington case, which relates to his political work and alleged attempts to hide income from 2006 to 2017. Prosecutors allege that during that time, he laundered $30 million as a consultant for pro-Russian politicians in Ukraine. His trial is set to start in the District Sept. 24. Washington Post writers Richard Leiby, Tom Hambuger and Craig Timberg contributed to this report.